rakuten toto : Buy BIG Win BIG. prize money up to 600 Million Yen!!! 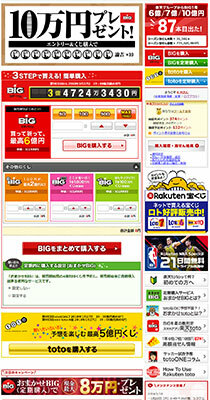 You can buy Rakuten toto Big Lottery anytime through the internet. Maximum prize money is 600 million yen per ticket though there is more carry over amount from previous lotteries. In case of no winner for the lottery the prize amount will be carried over to next lottery increasing the overall prize money of BIG lottery. Purchase or hand over of toto Lottery to person under age of 19 years is forbidden by law. Paid amount wont be refunded.